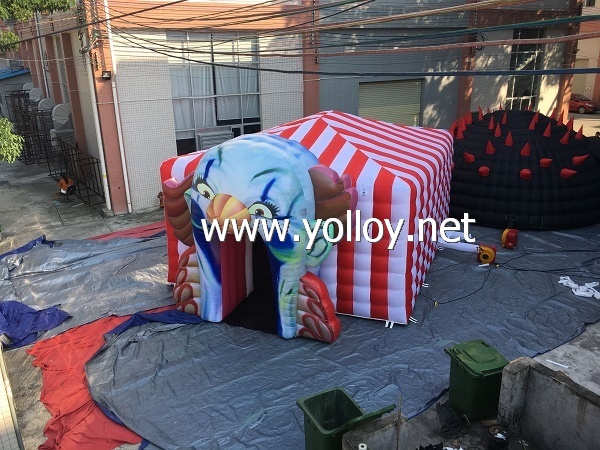 Inflatable tent with tunnel head offer a great deal of fun, excitement, and buoyancy for various occasions, also included to be used most frequently in holiday events. For above tent,we made it in commercial grade material which is high Durability, UV-Resistance, Flame retardant, waterproof and NO Lead. And we make it according to CE&EN71.We double stitch everywhere and fourfold stitch at the bottom point place. We use strong zipper and there is a zipper cover outside the zipper for protection,and we also make many fasten rings for fix. What' more we also offer UL certificated air blower.